I was a little bummed two years ago when Marvel Comics killed off the original Captain America, Steve Rogers. However, as you may know, this month Marvel is bringing Rogers back in a five issue limited series entitled Captain America: Reborn. 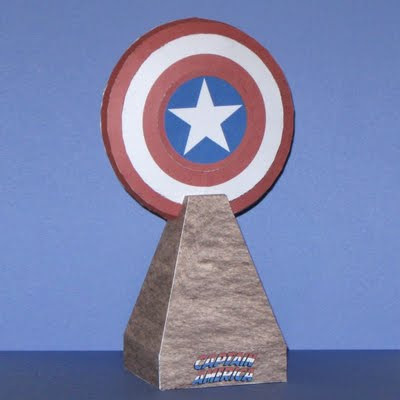 To celebrate, I did a recolor of my Tron Disc template to create a papercraft model that represents the good Captain's shield set in a stone base. Hope you enjoy it. I enjoy nicely detailed architecture papercraft. I am not sure why I don't post more of it, especially since I am an architect by trade. 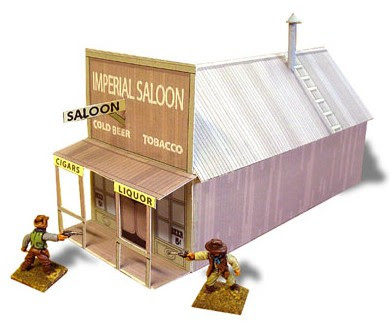 I will have to do better in the future.^^ This papercraft saloon is a free sample from Whitewash City which produces scale model building templates for use in Old West tabletop RPG games. All the models at Whitewash City were designed by Eric Hotz and are 30mm scale (also known as "S scale" or 1:64 scale). The PDF template for the saloon may be downloaded here. 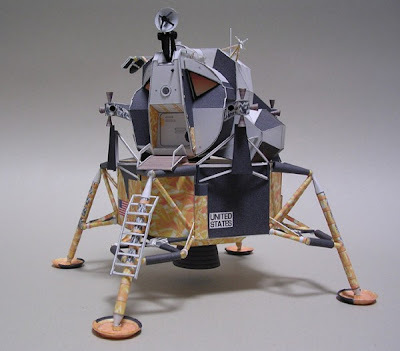 Last week was the 40th anniversary of the Apollo 11 moon mission, so the thoughts of some papercrafters (like myself) have been turned towards papercraft models of spacecraft. Here is one of the best crafted models I have seen in the spacecraft category. This 1:48 scale Apollo 11 Lunar Module was created by Japanese designer U-Don. 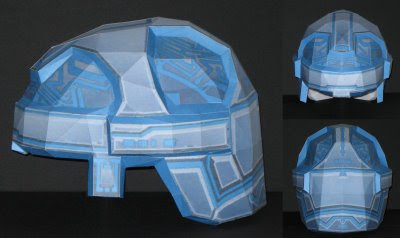 If you would like to attempt his ultra-detailed papercraft yourself, U-Don has provided a 13 page template along with 14 pages of photographic instructions on his web page here. 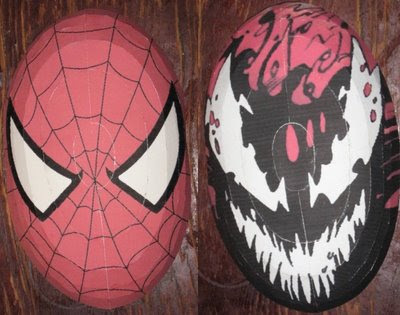 Finished Size: approximately 8"(20.3 cm) "ear to ear"
Mark Green, creator of the Golden Snitch papercraft I posted a while back, built Spider-man and Carnage from my Marvel Comics mask series. Since he did such a fantastic job, I just had to share his build photos. Keep up the good work Mark! 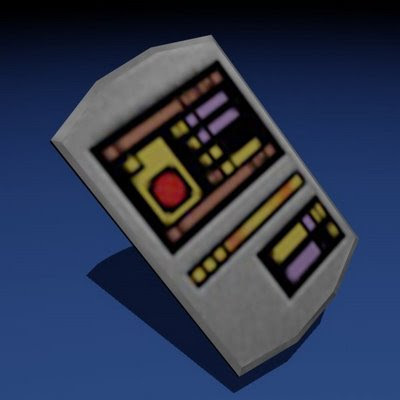 In the Star Trek universe there is an alternate reality where instead of the peaceful United Federation of Planets there exists the brutal Terran Empire. This evil alternate reality was first introduced in the original 1960's Star Trek television show episode entitled Mirror, Mirror. At one point in the Star Trek Voyager Elite Force video game the crew of Voyager encounter the crew of a Terran Empire ship. 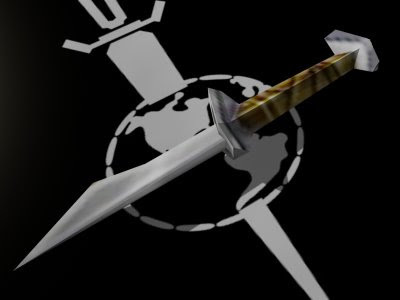 This papercraft is of the knife that some of the Terran crew carry. 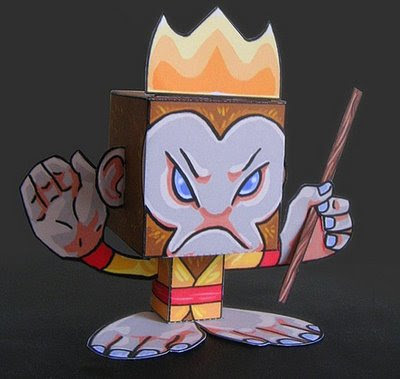 This paper toy based on the Pyra:Minds template takes its imagery from the Great Seal of the United States which appears on the back of the US one dollar bill. 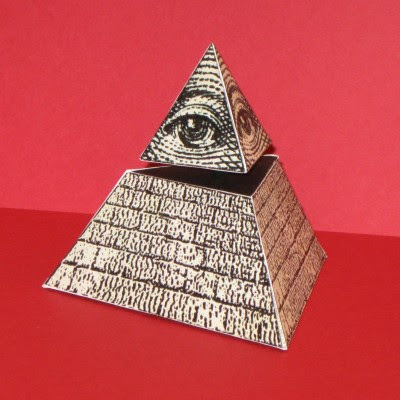 The eye at the top of the pyramid was referred to by the creators of the seal as "The Eye of Providence". Despite modern day Freemasonry's efforts to set the record straight, urban legends still abound that the pyramid is either a Masonic or an Illuminati symbol. Be that as it may, it still makes a nice companion to my Masonic Medallion papercraft. 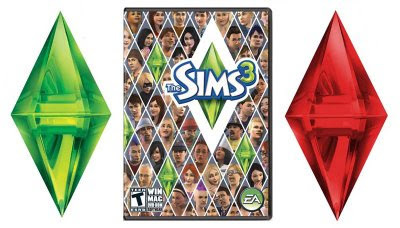 ^^ The template for the pyramid was created in 2009 by illustrator Maximiliano Garcia Luna of Argentina and may be found here. I achieved the hovering eye effect in my build with a carefully placed toothpick. 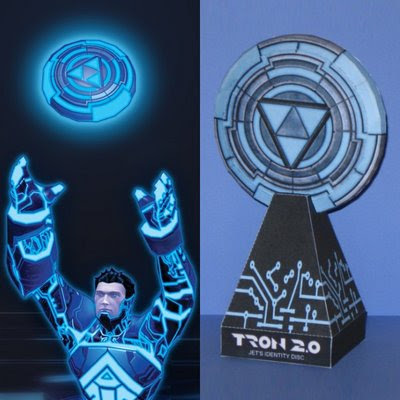 This is my third and final Tron identity disc papercraft. This disc, which is from the Tron 2.0 video game, has a more elaborate pattern than the discs I did previously. The owner of this identity disc is Jet Bradley, the playable character in the game. Jet is not a computer program like most characters in the game, but a human who has been teleported into the computer world. Jet's father, Alan Bradley, was the programmer who created the program known as "Tron". 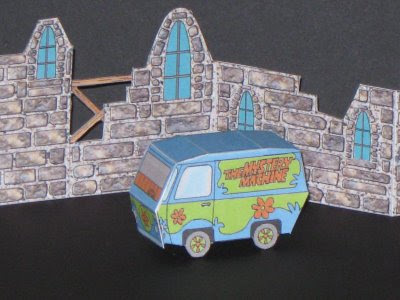 This 2" (5 cm) long Scooby Doo Mystery Machine van and ruined castle wall backdrop were created by Gary Williams and Craig Griswold in 2002 for use with the D6 Role-Playing Game System by West End Games. Included in the same PDF template as the van and the wall are cutouts of all the Scooby Doo characters. The PDF may be downloaded here. Also available are templates of an uncolored haunted bungalow model and a 3D interior of Doctor Who's TARDIS. 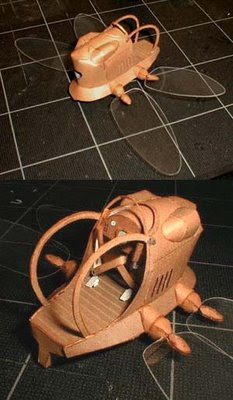 This papercraft comes from the 1986 animated movie Castle in the Sky, the first official movie release from Studio Ghibli. The flapter is a machine that flies by means of four vibrating insect-like wings. In the movie two young characters, Pazu and Sheeta, make use of the flapter in their adventures which eventually lead them to a legendary flying castle in the clouds. 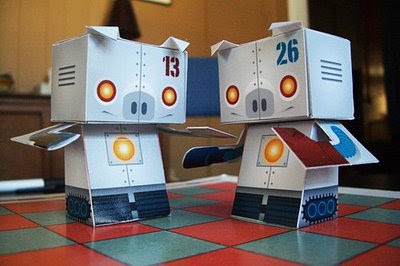 This papercraft was designed by "Orca", Japan, 2005. The template may be found here, while instructions in Japanese are located here. The wings may be built with either cardstock or clear plastic (as is shown in the photos). 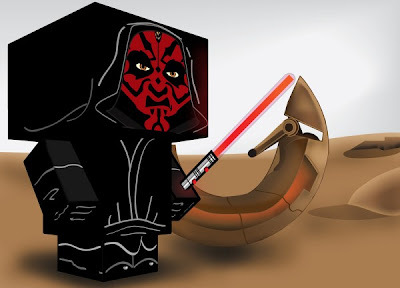 Illustration student Richard Sullivan was given an assignment at school to create a custom Cubee using a known character and this Darth Maul was the result. Why didn't I have these kind of assignments in school? ^^ The final template is three pages and includes two different Maul heads, two capes, a double light saber, and a Sith Speeder. The pages of the template are available at Richard's DeviantART page here, here and here.